It’s so easy to get lost in all this assortment of ankle boots which makes it even harder to come up with nice ankle boots outfit ideas. Don’t you worry: the time has come to sort out the types of this tricky footwear and discuss what to wear with ankle boots. These’re so many types of ankle boots of different shapes and colors one might even get confused why all these shoes belong to one type in the first place. But we know why – it’s all about the ankle. Cropped boots which end about the height of your ankle bone is exactly what we’re talking about today. And if you want to rock that ankle boots outfit the first thing you have to do is to choose the right pair. 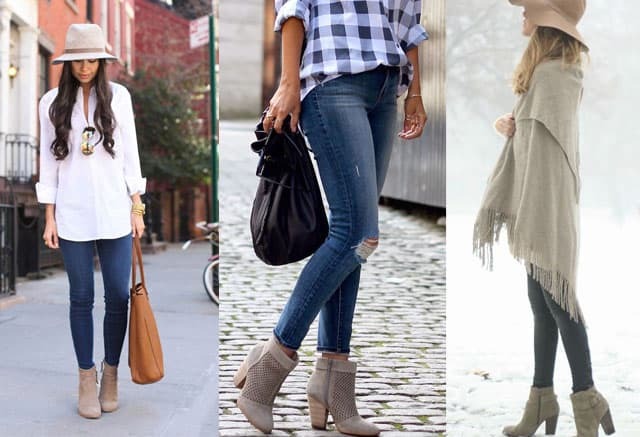 Heels, Wedges or Flats: Ankle Boots Outfit Ideas? This one goes down to your personal preferences and the style you’re aiming at. Will you actually have to walk a lot or just use them for a date at a café? Have you ever worn wedges before and what height of a heel would be too much for you? 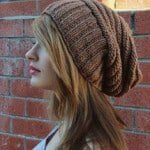 Consider this before making a purchase. Flats are extremely popular right now with all these chelsea boots and they suit both rockstars, office workers and exquisite ladies depending on a particular model. We also lied a bit: the trendiest flat ankle boots will most likely have a tiny heel about 1 or 2 inches. As for heels, well you can find both chunky and stiletto ones and the height will vary dramatically. Even though higher heels boost femininity make sure you can actually walk in the pair you’ve chosen to avoid pain and blisters. Wedges are probably less common and more tricky but if you feel like this fashion piece is right for you then go for it! 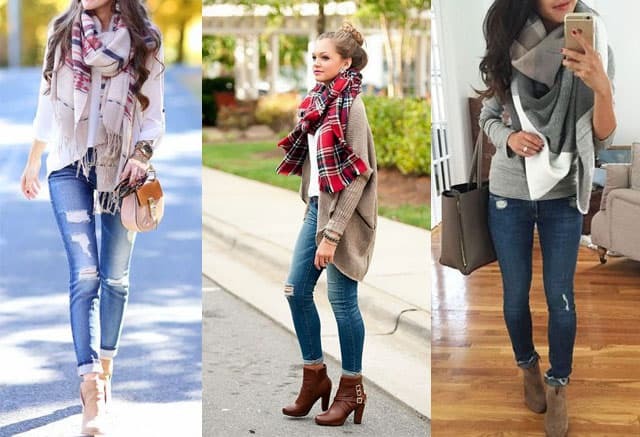 Skinny jeans are probably one of the best ways to wear ankle boots, but you can pair them with skirts and dresses as long as the ensemble looks nice. Crucial: If we could give you just one tip on how to wear ankle boots that would be it: choose the right boot height. Thin ankles are just gorgeous and you don’t want to ruin this look by choosing boots that’ll cover the whole beauty. When it comes to ankle boots outfit ideas better go for shorter than longer. Ankle boots are so diverse you have to have a picture of the look you’re aiming at in mind to actually put it together successfully. Heel or flat, suede or leather, black or prints and glitter – every single detail can make a difference. The most popular ankle boots right now are black ones with chunky 2-3 inch heels. Not only they’re really comfortable to walk in, but they also look extremely sharp both when they’re plain and when embellished with metal plates, chains, rivets and zippers. Potent leather is in again and it looks amazing! FYI if you’re sassy enough. Suede heeled options are rather classy and look less extreme. Brown might top all the other colors but if you find a pair in forest green, terracotta or marsala it’s gonna become your favorite footwear till it falls apart of tear and wear. Wanna make a cute outfit with ankle boots? Then go for a dress and really high heels. Dresses are banned from your closet? Then a pencil skirt and a classy shirt will do. You will look so elegant in gray long skirt and silver booties… Too boring? Then high waist jeans and a crop top will be the best option that’s gonna make your legs look mile long! You’ll be surprised but there’re fabric ankle boots as well and their designs can be so crazy. If you have nothing against vivid prints, excessive glitter and experimental colors let your imagination loose and treat yourself to one of the craziest pairs of boots you can find! BTW technically timberlands are ankle boots too so check out ways to wear these kinds of footwear on our site as well! Brown ankle boots with jeans shirt and dark blue mini dress is the ideal feminine image.